In 2014 and 2015, we saw house price growth rates below 2%, but in 2016, prices rebounded by 3.4% accelerating to 3.7% in 2017. We think 2018 could see peak growth as we forecast 3.8% but then a decelerating trend for the coming years. Nevertheless, house price growth should remain above inflation, with growth forecasts of 2.8% and 2.6% respectively for 2019 and 2020. Low-interest rates, supply shortages in some countries and accelerating economic activity that increased disposable income and hence demand has so far supported this growth. With consumer confidence still at a high and very generous financing conditions, the recovery should continue, which in turn is positive for activity levels and employment growth. Business confidence in the construction sector reached levels in 2017, not seen in the last ten years, and hiring intentions followed. 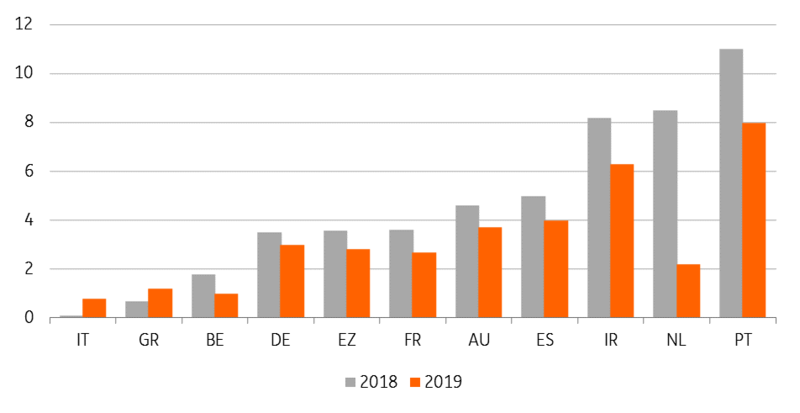 This is likely to decrease supply shortages where they still exist, which - together with slowly rising rates – should limit house price growth somewhat in the whole of Eurozone in the coming years. Since 2009, real estate prices have increased around 40 percent on the back of low interest rates, strong economic growth and record-high employment. The overall number, however, significantly masks diverging trends across regions. 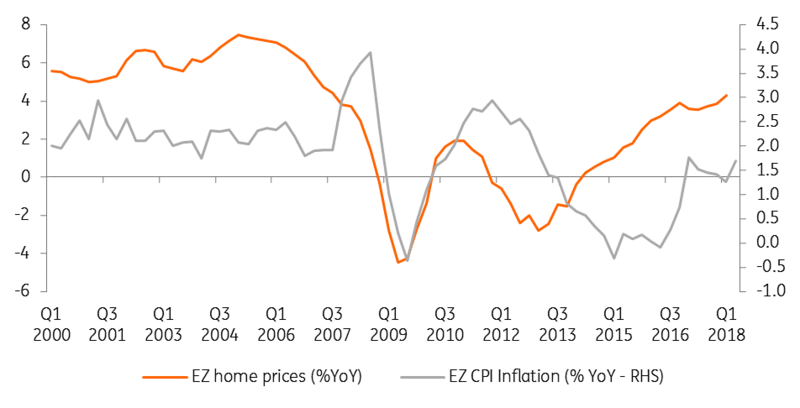 As in many other Eurozone countries, price increases have been much more accentuated in urban areas. The 40 percent increase across the entire country compared with an 80 percent increase since 2009 in the seven largest German cities. Even though affordability, as measured by the price-rent ratio, has clearly deteriorated, there are still very little signs of a textbook-style real estate bubble. In fact, private household indebtedness has come down both measured in terms of percentage of GDP and in terms of percentage of disposable income. The share of mortgages in private household debt has remained stable. Also, the share of longer-term mortgages (i.e. loans with maturities of more than ten years) has increased in recent years. Going into 2019, new orders in the real estate and construction sector signal some levelling off in activity. At the same time, however, the lack of real estate in urban areas combined with continued low interest rates and solid economic fundamentals points to ongoing strength in the real estate market, albeit at a slower pace. Some regional hubs are more dynamic than the average, with the champion, Bordeaux, which benefits from a new high-speed train link to Paris, posting a 25% growth over the last five years, against a national average of only 1.7%. Does not look like overheating with an increase of +25.4% over the last five years. French housing prices are now 12% above their pre-crisis peak of mid-2009, and we expect them to continue to increase, by 2.7% in 2018 after 3.2% in 2018. 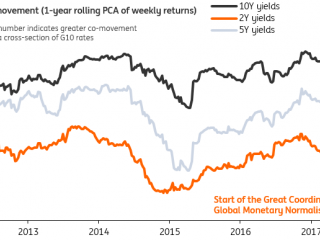 A slowdown is therefore visible despite the fact that interest rates remain market supportive. It is worse in new housing activity though, as construction activity, which grew by 2.9% in 2017, stabilized in 2018 (-0.1% YoY so far this year). This had been confirmed by households’ investment growth in 1H18 GDP figures (it increased by a mere 0.2% QoQ in 1Q18 and declined by 0.1% in 2Q18, their lowest rate since 2015). While this sector has been recovering since 2015, we continue to see there the first signs of a peaking housing market cycle. As long as interest rates remain supportive, we do not believe in a hard landing, but construction activity figures since May are a sign that the housing market could be cooling down somewhat. In July, construction activity declined again, by 1.8% MoM, its 4th month of decline so far this year. This came despite very high confidence in the sector, record high capacity utilisation and order books: so, if there is no sign of demand dropping yet, some labour market shortages could well be part of the explanation. This is why we still think that house price growth should not plummet either. For the time being, this has been reflected in higher house transactions, but at a declining pace. In 1Q18 the number of house transactions was up by 4.3% YoY (6.5% YoY in 4Q17), confirming close to the average 2017 growth rate. Improved affordability is making the purchase more attractive. The recovery in loans for house purchases continues at a stabilised 1.1% yearly clip. Overall, the mood of real estate agents remains decently upbeat on activity, but times seem not ripe yet for a quick turnaround of market valuations. According to the July 2018 BoI-Tecnoborsa survey an increasing share of agents expects prices to stabilise over the next 12 months (76.6% in 2Q18 from 71% in 1Q18), and the share of those expecting prices to rise increased only marginally (to 3.9% from 3.6). The loan to value ratio, at 75%, is now higher than before the outbreak of the great financial crisis and is stabilising; the ratio of house purchases financed via mortgages, instead, increased further to 81.2%, highlighting an increasingly close link between credit availability and house purchases for financially battered households. Encouragingly for house price developments, the survey shows that the average discount from the original offer price declined further to 9.9% (from 10.9% in 1Q18). Latest Istat house price data shows a divergence between existing homes (still on a decelerating decline) and new homes (picking up). We expect the ongoing moderate recovery of disposable income, in conjunction with still cheap mortgages, to support further house purchases. However, the ample slack in the market should prevent a big short-run showing on prices. We expect average house prices to edge up only marginally in 2018, and to post a modest acceleration in 2019. In Spain, house prices grew by 6.2% YoY in the first quarter of 1Q, compared to the 7.2% QoQ in 4Q 2017. This is the first deceleration since the second quarter of 2016. For the rest of 2018, we expect house prices to moderate further and forecast an overall growth rate of 5.0%. Nevertheless, this is firmly above the Eurozone average. In Greece, signals of an economic turnaround are getting more consistent, but the pace of expansion remains modest. Encouragingly, the recovery of employment (the main engine of disposable income) seems to be continuing at a decent pace. To be sure, the delicate position of Greek banks on NPLs is still weighing on house-purchase related mortgage lending. In July, lending for house purchases was still contracting at a 3.8% YoY clip. Improving confidence and income conditions were enough to stop the fall in house prices in 1Q18 and to induce a 0.8% YoY increase in 2Q18. The perspective of the end of the third ESM programme might have helped, as could over the next few quarters the actual exit effect. To be sure, with the level of taxation on real estate assets still extremely elevated, barring unexpected accelerations in the pace of economic recovery, a sharp acceleration in house prices in the short run seems unlikely, notwithstanding very depressed current price levels. We see the YoY price recovery to continue over the next couple of years at a slightly accelerating pace. In Portugal, house price growth is accelerating since early 2015 and reached 12.2% in the first quarter of 2018. This is almost twice the rate of Spain and three times the rate of the Eurozone. The strong growth rate is caused by strong domestic and foreign demand, while supply cannot keep up. The government could take some measures in its 2019 budget to alleviate the pressure. Foreign demand, for example, could be reduced by adjusted programs such as the golden visa and the non-habitual regime. Recently, however, Costa announced that people who return to Portugal in 2019 and 2020 could get a reduction of income tax and discounts on the return trip and in housing. The demand for houses will go up even more due to this policy, which has the potential of pushing house price growth even higher. We expect house prices to grow by 11% this year, compared to the 10.5% growth in 2017.